I've never laid carpet, tiles or lino but there is one floor I do know how to lay and that is the carpeting for the outdoor room. I speak of course of the most popular garden ground-cover, the lawn. Areas which are very shaded, as this leads to moss infestation and lawns which are always damp. Areas prone to water logging, as this will weaken your grass over time, allowing moss and damp soil weeds to take over. The best time to sow grass seed in Ireland is between early April to late September, however, you must firstly carry out some vital soil preparation. The first thing to look at is your soil depth, Most lawn grasses require a soil depth of 15cm (6 inches) to grow well. If your existing site cannot provide this, you must import clean soil which is weed-free and non-sticky to make up this level. Once you have the correct soil level you must then prepare that soil for seeding. Ideally sometime between March and August you must "burn off" any unwanted growth across the whole of the site which is to become your lawn. Achieve this by spraying all weedy soil areas on a dry day with a herbicide containing the active ingredient Glyphosate. Glyphosate is available in products such as Roundup, Scutchout, Gallup or Touchdown. Apply the chemical according to the manufacturers instructions and heed safety warnings. A minimum of 1 month must elapse before you start to grade or level the site, this will allow the sprayed chemical to travel all the way to the deep roots of weeds such as docks and dandelions. Ensure nothing but light rainfall occurs when you are carrying out soil movement and grading whether it be by hand or machine. This will prevent creating a pan in the soil (a layer of smeared soil or subsoil that water cannot drain through). Another drainage problem is caused by the use of heavy machinery (tractors etc), they can cause compaction of the soil especially if used on damp soil. Compaction destroys the spaces and pores between the crumbs of soil. A lawn sown on compacted soil will retain surface water after rainfall and grass growth is weak and sparse often followed by moss colonisation. Soil that has recieved heavy traffic will require cultivation and/or ripping to remove compaction. You must grade the site to an acceptable level without bringing subsoil to the surface; subsoil on the surface has ruined many the new lawns by causing hungry looking brown or yellow patches. If the soil you sow your lawn seed into is a mixture of subsoil and topsoil, it follows that your eventual lawn will be patchy and many shades of brown, yellow and green. When grading your soil remove any half buried timber and old tree roots as they will lead to toad stools in the established lawn. Also remove any concrete blocks and large stones; basically remove any debris bigger than your fist.
. Essential tools for lawn creation, photo / pic / image. Leave the graded site to settle and regrow any dormant weeds for at least a month then respray any fresh weed growth again with a Glyphosate based herbicide. All this spraying and respraying may seem excessive, but it will provide you with a lawn free of perennial weeds and tufts of coarse grass. For the final cultivation give the soil a shallow rotovate or lightly dig it over with a garden fork whilst breaking clods with the back of the fork. Be warned, do not work the soil while it is wet, this will destroy the soils structure leading to poor drainage followed by infestations of moss in you lawn. Rake to an acceptable level whilst removing all surface debris down to the size of a 1 euro coin including weed stems and roots. 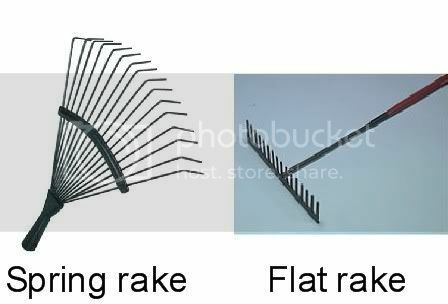 The best rake for this task is a flat rake (see image). The soil should have a nice fine tilth like the texture of cake crumbs; it should not be fine like powder as this will prevent seed germination caused by soil capping. Also, if the soil is raked too fine it will turn into a "mud pie" with the first heavy rain shower, and your newly sown seed will be washed into a pool at a low point in the site. The ideal situation would be to sow the seed before you get the next heavy shower of rain as at that stage you will begin to loose the soil tilth. You will need to spread approx 45 grammes of seed per square metre, which can be broadcast by hand or use a wheeled spreader.
. 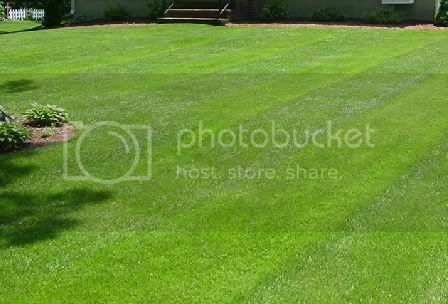 Spreading lawn seed using a drop spreader, photo / pic / image. A 25kg bag of lawn seed covers approx 550 sq metres at a rate of 45g to the square metre. A 10kg bag of lawn seed covers approx 220 sq metres at a rate of 45g to the square metre. Firstly, give the grass seed you've bought a good mix with your hands, bringing the seed on the bottom of the bag/carton to the top and then mixing it throughout all the other seed. You carry this out because lawn seed mixture is made up of 3,4,5, or more types of grass seeds mixed together, you don't want to sow all the smaller seeds in one section of the lawn and the larger seeds in another. Divide the grass seed into 2 lots and spread half the seed whilst walking up and down the proposed lawn, with the other half being spread whilst walking left and right across the lawn. The seed can be spread carefully by hand or you can spread it by mechanical means using a drop spreader or spinner spreader. When spreading any seed avoid spreading onto drives, patios and beds. Lightly rake the seed into the soil with a spring rake (see image), do not drive it in or bury it. Follow this by lightly rolling the area with a half-filled water roller; the idea is to get firm seed and soil contact to ensure germination. Have some extra soil and seed to hand as a hollow or two may show up when rolling, you can then top up the soil and give it a shake of seed. Depending on the weather conditions your seedlings will begin to appear within 2 to 3 weeks. Germination of the seed is surprisingly fast in warm, moist weather. Should you be unlucky enough to receive an extended dry spell directly after sowing the seed (no rain approx 2 weeks) , you may have to consider artificial watering such as using a sprinkler on a large area or a watering can on a modest sized lawn. If you resort to using a sprinkler ensure that a good heavy watering is applied, not just a sprinkling. A gentle sprinkling will only wet the surface of the soil to encourage seed germination, but the moisture may evaporate by the time the seedlings need to put water seeking roots down; no further water available combined with drying conditions will result in grass damage. No doubt, a few annual weeds will germinate along with the grass seed, these weeds are nothing to worry about and will be cut out over a few mowings. If you wish, you can hand weed these invaders to prevent them goind on to flower, and then seed. You should have no major problem with perennial weeds (docks, thistles etc) if you have followed the spraying and fallowing rules mentioned near the top of this article. You may begin mowing once the vast majority of the germinated grass seed has reached a height of 8cm (3 inches) across the body of the lawn. Newly seeded lawns take approx six to eight weeks after sowing to get to this height. Before you carry out your first mowing the lawn must once again be rolled with the half-filled water roller to settle any stones that may have been brought to the surface or exposed on the surface. Do this on a day when the surface of the soil is moist. 3 days later when the grass sits up give the lawn its first cut.
. A walk behind (pedestrian) rotary mower, photo / pic / image. For the first cut your aim is to just lightly trim the tips of the new grass plants. This will help the lawn thicken up and will aid the control of any young weeds that may have appeared with the germinating grass. If you have a ride-on lawn mower I would suggest you avoid using it for the first three or four cuts of your new lawn, instead use a walk behind (pedestrian) rotary mower. A ride-on mower plus the weight of its driver can often cut up a new lawns surface especially at points where the mower must turn. After three or four cuts with a pedestrian mower your lawn will start to build up a strong root system that will prevent the surface of the lawn from cutting up. Ensure the mower has a sharp blade to ensure a clean cut without tearing the grass. Also ensure you collect all the grass clippings in the mower bag. After the first 3 mowings gradually lower the mower blade over successive cuts to its optimum mowing level. The optimum mowing level or correct lawn mowing height is approx 1.25 inches (3cm) for a lawn sown with a No.2. Lawn Seed Mix. A general purpose spring/summer lawn feed (without weed or moss killers) can be applied to the new lawn after its third cut. Feeding any earlier or applying a weed/mosskiller in this stage (or anytime during first six months) will more than likely scorch the young grass plants. Mow your new lawn at least every week during its first growing season to allow it to thicken to a dense carpet. Sowing a lawn--- Frequently asked questions. How late can I sow a lawn in Ireland? In all honesty, with the mild winters we have been having recently, you could sow a lawn in December. This is especially true in coastal regions, due to the warming aspect of the nearby water. However I personally would never sow lawn seed any later than the end of September, as once the seed germinates, the ground at that time will usually still be dry enough to allow two or three thickening cuts. Whats with all the different numbers on the grass seed bags, No.1. grade lawn seed mix, No.2. grade lawn seed mix , No.3. grade lawn seed mix ? Which one should I use to sow my lawn? Choosing the right grass seed for your particular lawn usage can save you a lot of work and heartbreak. A No.1. Lawn Seed Mix is made up of very fine grasses, think "putting green", and you are on the right track. If you want a perfect and prestine lawn and are prepared to work hard at maintaining it by never missing a mowing, fertilising or weed killing session, then this is the grass seed mix for you. However be aware, this type of lawn is unforgiving of heavy traffic and poor maintenance. A No.2. Lawn Seed Mix is the good all-rounder, it looks well, takes a reasonable amount of wear & tear and requires just a moderate degree of maintenance. A No.3. Lawn Seed Mix is ideal for kicking a football about on and in general it puts up with lots of abuse. However be aware, This seed mix comprises some coarse grasses which may not be as attractive to the human eye or touch. Any queries or comments on How to sow a lawn from grass seed in Ireland-Lawn Hints/Tips, please post below. This is a really great guide which I am sure has been very helpful to a number of people over the years! The explanation of numbered grass seed certainly solves the mystery of why a quarter of my lawn looks like a mass of weeds! Nothing for it but to dig it back up i presume? I tried a variety of lawn mixes simultaneously which was a bit silly in retrospect! Maybe if you used a selective weed killer for lawns and later (for how much later see pack instructions) you could scarifying the surface a bit and re-sow over the top of what you have? Unless you are very fussy about the final appearance, that might suffice. I'd some percolation area issues recently which required digging up half the lawn. I've spread new topsoil, leveled it out, and sown grass seed. Thing is, there's not a budge in the grass seed and I mean not a budge!! I don't see one new blade of grass surface. It's down about 2 weeks at this stage. The seed is about 2 years old (or maybe longer) and stored in the garage in a sealed plastic container - away from moisture. I'd be surprised if it has all deteriorated, much of it is probably viable. However, it won't sprout until conditions of soil temperature and moisture are right. As soon as this happens you will almost certainly get a sudden flush of green across your garden. Maybe its not so bad if there are to be no food plants grown in the area? But maybe an alternative method of weed removal would be better? Any ideas? there's essentially no way you can definitively point to a cause when discussing cancer. That is what his consultant wrote in his report. Such a great guidance. It’s very useful resource for us. Thanks.